The VM510CB is the entry level VM type dual magnet cartridge equipped with a conical bonded diamond stylus that is less likely to be affected by placement providing for stable tracing performance. The cartridge features an aluminium cantilever, para-toroidal coils to improve generating efficiency, permalloy centre shield plate between left and right channels to reduce crosstalk and durable low resonance polymer housing. 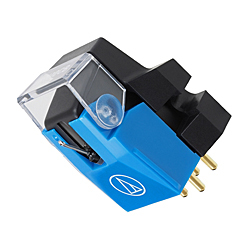 The new VM range of cartridges incorporate Audio Technica's internationally patented dual magnet design that replicates the structure of the vinyl cutter head by using two magnets arranged in the shape of a "V" to match the positions of the left and right channels in the stereo groove walls for optimum channel separation, extended frequency response and superb tracking. The styli fitted are interchangeable throughout the range so it is possible to upgrade a cartridge by fitment of a higher specification stylus at any time.